Next Generation Bi-directional Steerable Guiding Sheath! The Destino� Reach� offers a rotating collar, on an ergonomic handle, which allows precise deflection of a bi-directional tip. 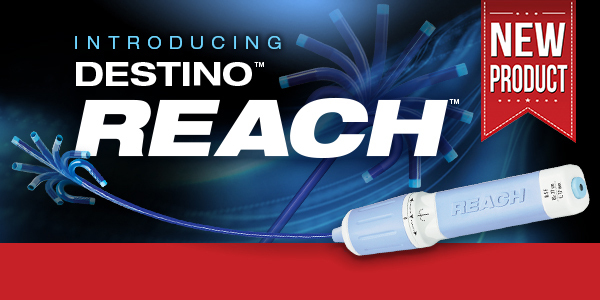 The Reach� is an agile tool in gaining access to difficult locations, while maintaining hemostasis with Oscor SureSeal� technology. The Destino� Reach� series is available in 8.5, 10, and 12 French sizes and a variety of curves, and lengths.